← Day #1: First Day Down, 16 More to Go! This is the blog from yesterdays run that we were unable to complete on account of the poor internet connection. Blog about completing Km 50-75 today will be up soon! Two days, 51 kilometers completed. We have all made it, but the kilometers are definitely not getting any easier as we continue down the long, hot, and dusty road. But, we shall continue; one day, one kilometer, and one step at a time until we reach our goal. The team ready to begin Day 2! Today I woke up a bit sore and heat exhausted from day one, but still in good spirits and ready to conquer day two. I started out running with Cielianna and Pa. Right away, a side cramp steps in as if I had never stopped running from yesterday. So this is how its going to be today, I think (I’m still working on balancing drinking enough water (you can never drink enough water here) to stay hydrated, but not too much so that I cramp up. Not to mention trying to find some food that I am used to that is somewhat nutritious – I had some greasy fries with mayonnaise and coleslaw for dinner; its not the easiest place to be a vegetarian). I focus on my breathing and count my steps, the cramp eases. Then, as if I need another obstacle to deal with, my nose starts bleeding about 4km in. The team passes me some tissue, I stuff some up my nose (sorry for the graphic image) and continue running. Luckily, this does the trick and about 6km into the run I am cramp and nosebleed free. Phew – now I just need to keep my head down, my pace easy, and get through the rest of the day. About 12 km in I am told that we are approaching another school in which the NSGA implements its peer-health education programs. A small group from the school had walked a distance to meet us on the main road on a Sunday to sing and cheer us on. Once again, this spirit from the Gambian community was amazing, and helped to inspire me and the entire team to continue our journey. After saying many thank-yous and shaking many hands, we continue. 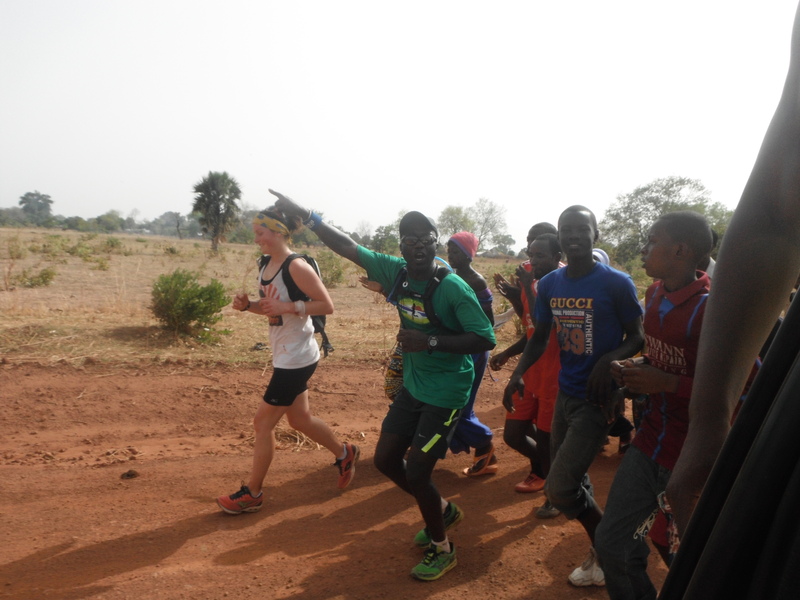 However, this time we have an addition to our team; a 15-year-old peer health educator named Abdoulie Baleeh from Kundank School had decided to continue running with us – and not just for a kilometer or two, but for the rest of the first part of the day. Not only that, he was also only wearing socks with sandals and blue jeans in 40-degree Celsius weather. He said that he really liked the NSGA peer-health programs and that they were really important to him and his school, and this is why he wanted to run with us. Pretty inspiring and motivating words to hear right when you need them. 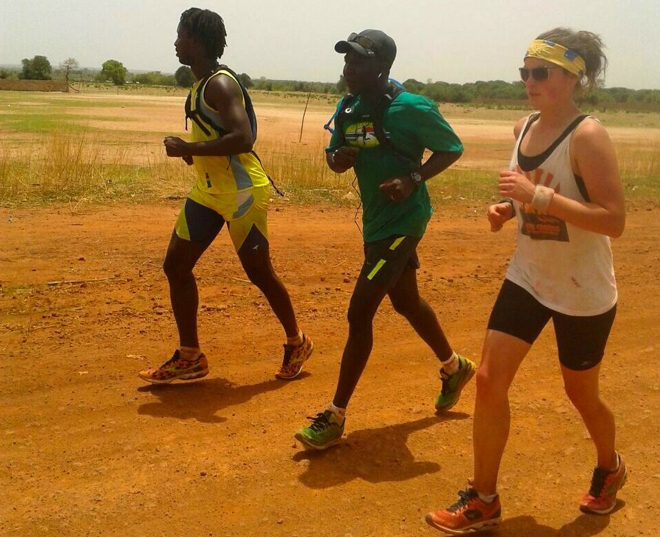 Finally, after many Gatorade and ‘cool down’ breaks, we make it to the 20km mark, which means it is time to rest. This is becoming the favorite part of the day. I am so hot when we first sop, I feel as if we may never cool down. Slowly but surely my heart rate lowers, I can feel a bit of a breeze, and I begin to relax. We are all a lot less talkative at the start of the break today than we were yesterday – the exhaustion from the travel, running, and heat is increasing. However, slowly, everyone returns back to life, begins making jokes, and I know it is time to grudgingly take a gel and finish off the last five kilometers for the day. Kebba always has the strength to yell BANJUL CALLING! Also, I would like to recognize and dedicate the run today to Mizuno Canada, who has generously donated lightweight clothing and shoes to me and the team. Although I did not have much of a chance to train in the lightweight clothing in Canada on account of the never-ending winter, it is so amazing to have it while in 40+ degrees Celsius weather. Thanks Mizuno! 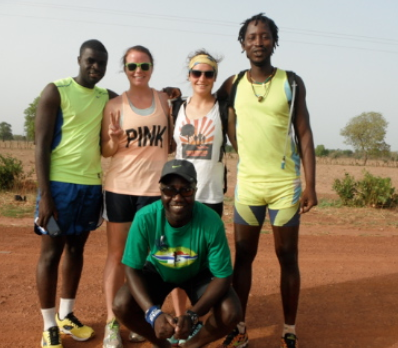 This entry was posted in Charity Run, Developing Country, International Development, Peer Health Educaiton and tagged Gambia, Hot Africa, Mizuno, Nova Scotia-Gambia Association, Peanutbutter Gels, Peer Health, running. Bookmark the permalink. 3 Responses to Day 2.. We have arrived in Basse! I don’t think we met but I’m following your blog. I’m friends with Keba (say hi to him for me if you will, from Rick Gunn!) I’ve been to the Gambia three times, taking senior high youth from Bedford United Church to experience the culture of the Gambians and to see first hand the excellent work of the NSGA. Thanks for making such a HUGE commitment of your life and heart to support the NSGA! You are an inspiration!